How can you start your blog with such a simple recipe? No, no no. This is something more than that. This is my beloved porridge recipe. The easiest and quickest recipe you can ever imagine for breakfast (apart from cornflakes with milk, obviusly). We are bringing our porridge ( or for all my American friends, OATMEAL) game to the next level. The key is the slow cooking and stirring and the toppings! The mashed banana is just the icing on the cake. 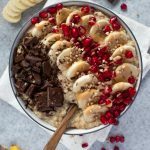 Adding a banana will not only make your porridge sweeter but also creamier. YES, I only use water. This is the traditional Scottish way of doing it! (Yes, my daddy is from Scotland, but I actually never ate porridge as a kid.? Let me know your opinion about this porridge, if you want to see how I made and decorate it, just click on my Youtube Channel! Put your oats in a smaller pan and add about 500 ml water. Mix in the grounded cinnamon. On medium heat, bring it to boil while stirring it regulary. Add some more water. It it gets too liquidy, just cook it for longer. Make sure not to burn it. After reaching the consistency you want, remove from the heat and add in your mashed banana. Serve in a big bowl topped with anything you want. I used bananas, pomegranate seeds, peanut butter and dark chocolate. Nothing better than the melting dark chocolate on your porridge. The cool thing about porridge is, that even after taking some pictures of it and arranging the background 3x times, it will still be warm. Enjoy it my friends! 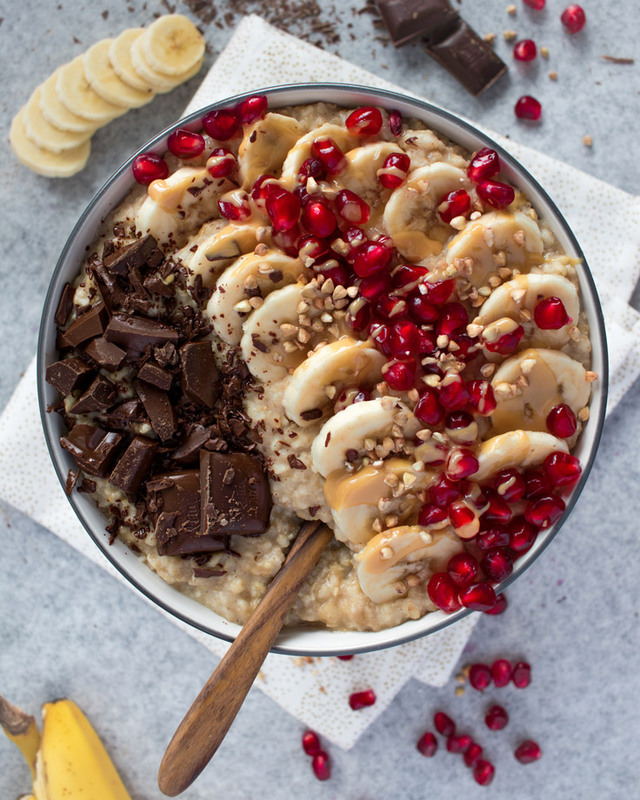 Share this recipe with your friends who said porridge was boring, or even better. MAKE it for them!